I have never heard of mirabelles. Do they have another name? I am going to be fighting the birds and stinkbugs for my figs and tomatoes again. This year we are going to try netting. Let's see how that works! Nice pics! Your gardens sounds great Nic. I havent heard of mirabelles! They do look interesting. I have tried raspberries but they drowned and its too hot here for potatoes, (I really miss jersey royals) but we do really good with tomatoes, peppers, (though yours look like they are further in than mine), squash of all kinds, and tons of herbs. Thanks for the pictures. I've also never heard of mirabelles. Are they tart? Or sweet? Oh I love those red chillies, and 24 of them! WOW! what kind are they? Looks like the garden is doing wonderfully! 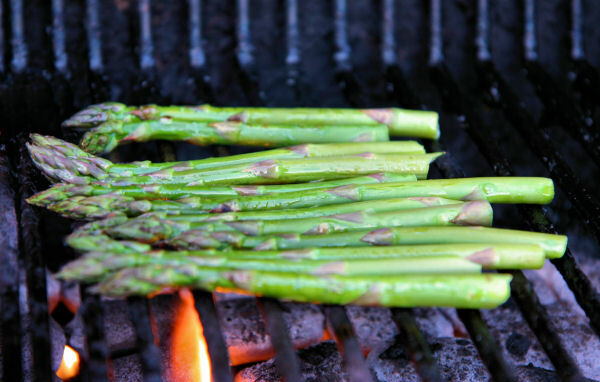 Oh, and that asparagus on the grill sounds amazing. 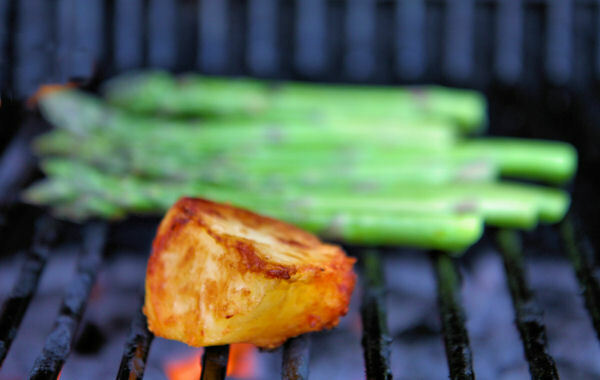 I adore asparagus--especially when it gets a bit charred from the grill. Delish! WOW...love how good & pletiful the garden is looking. LOVELY! Love the barbie too, yum grilled spears, & the naughty spud! Can see that someone is BUSY enjoying the good summer days. YAY!! Do you know I have a 'glad-eye' nightingale in the garden, that eats every single chili from my plant the minute the chili turns red! 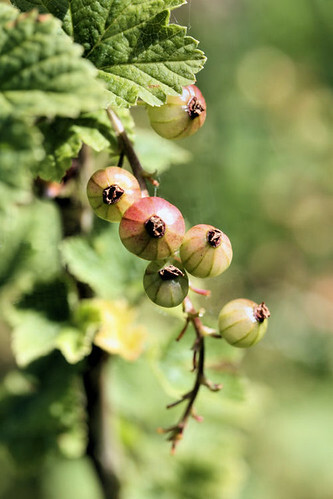 Oh yes...forgot to say I am ENVIOUS of the redcurrants, & am trying to figure out what a mirabelle is all about. Exotic stuff Nic! I'm glad you have a green thumb! What wonderful photos! Your garden looks sooo lovely! I love gardens. 24 chili plants, that's a lot. Love the pics! Run that past me again - 24 chilli plants??? 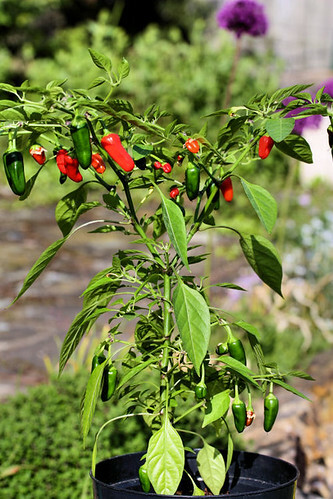 What will you be doing with all the chillies? Everything is looking blooming good! I am especially envious of your chilli plants. Such nice photos! And the grilled asparagus sounds wonderful. How great for you to have such a fab garden! Your chilli are gorgeous! I can't wait for my to turn that colour. 24 chilli plants - just a few LOL! Great stuff Nic all looks fantastic. 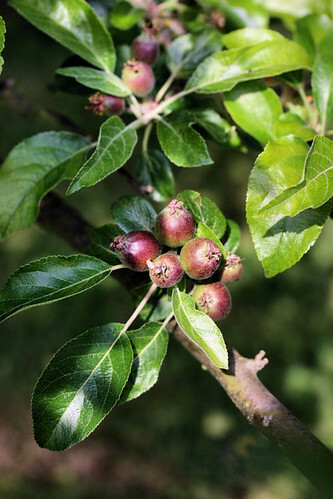 Looks like you're going to have a bumper crop this year! Chow and Chatter - thank you! Dragana - thank you! 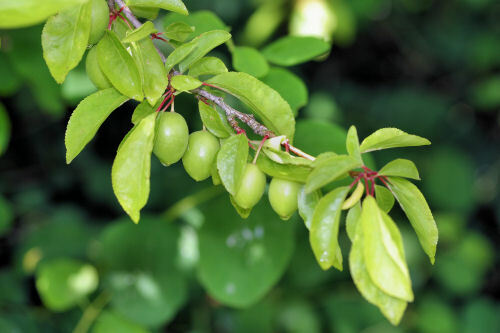 Mirabelles are like little yellow plums. Chris - I think the Jersey Royals are nearly at the end now, I love them too! Caviar and Codfish - Mirabelles are like little plums and are sweet, but a little tart around the stone. Anudivya - we have a bunch of different varieties - those ones are firecrackers I think. Elyse - thank you! Mmmmm... asparagus! Deeba - don't ever send that birdy here, never ever, LOL! Sunita - yep, there is a lot to take care of! Marta - isn't grilling great? Helen and aforkfulofspaghetti - thank you both! I now it's a lot of chillies, but I am getting through the first couple of plants and they are all different varieties, and the chillies will come at various times, some much later in the year. mangocheeks, Sophie, Lisa, Sylive, Rosie, Dragon, Jan, Diva, Sam and Susan - thank you all so much for your wonderful comments! I just have a little herb bed outside in my porch. Maybe next year I'll get into the gardening spirit. LOL. Lovely produce! Wowowow! I feel like roasting some fresh asparagus today! I got a little hungry just looking at the fine roasted butter-coated asparagus there. Plus, those chili are really doing great! They would perfectly fit a spicy Mexican chili con carne for dinner!